While searching the internet for some nice pictures of Le Club 55 (see this post), I noticed the work of Jean-Michel Berts. This French photographer has a weblog at Le Monde (a French newspaper) and his own website at www.jeanmichelberts.com. Those of you who already looked at my own portfolio know that I like black & white photography a lot. Due to the large amount of digital camera’s and the growing number of people who take pictures on a daily base, good B&W photography is hard to find these days. In his work however, Jean-Michel Berts shows that a picture does not need colours to express a certain feeling or atmosphere. The picture above shows the entrance of MusÃ©e d’Orsay (Paris, France). More about this museum at Wikipedia. I am a big fan of Jean-Michel Berts, in fact he is one of those photographers that pushed me to get into photography. I recently went to Musee d’Orsay to try out my luck and see if I could come up with a similar photo. 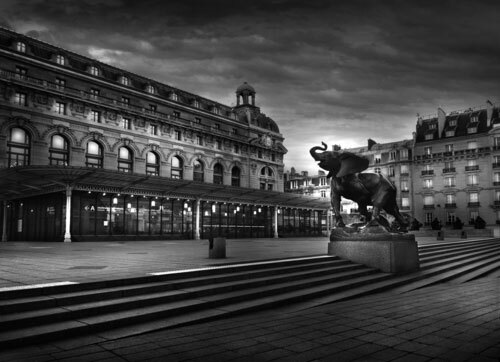 Here is my black and white pic of Musee d’Orsay and their great animal sculptures.